I have that song going around and around my head. And you probably have too now. You’re welcome. If you haven’t, well, I have embedded the video below (I am that kind). You see, it’s not just what you do, it’s also the quality of the effort of what you do. Micheal Breen does a really good example with shaking hands. Someone who just holds on a little too long (I am sure you have met them…). Sadly this is something I am all too aware of. One of the reason I got interested in NLP was that I was a shy person who had no idea how to really talk to anyone. I would either sit in silence or ramble on and on and on and on and on to fill the uncomfortable silence. NLP was an excellent way of both improving my mental state (and therefore not feeling so shy), and teaching me better ways to communicate and build rapport. The problem is I misunderstood a key tenant of rapport – there is a golden rule that is often talked about, and that is “we like people who are like ourselves”. I got stuck on the word “like”. I thought to be effective at communication everyone had to like me. I had to stand under a shower of unadulterated praise. I would do all the “right” things when it came to the content of my communication, but I would put too much effort into it to get people to LIKE ME! And I would act like an over excited puppy. This over eagerness to please, and the desire for positive feedback, had the exact opposite effect to what I was after – people didn’t like me, they actually found me irritating. I didn’t do this every time, but I tended to do it when I felt it was important that the person liked me (oh the irony). 1. Feedback was a major issue. I was lacking sensory acuity (a fancy term for paying attention AND knowing what to look for). I struggled to read people, so I would demand overt feedback that the communication was working (that I was being “liked”). If I didn’t get the feedback I was expecting or hoping for, I would ramp up what I was doing in an effort to get that feedback (either say more things, or ramp up my state and say things louder and faster and with more animation). 2. 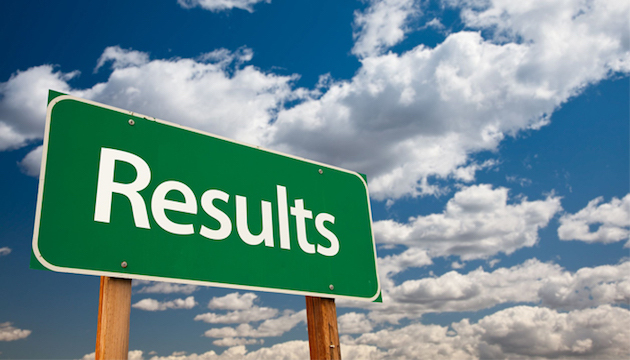 But the most important thing that it took me much longer to finally discover (far too long), is that often, if you aren’t getting the results you want, you need to tone it down not ramp it up. In a strange way the secret was to not care too much (in the politest possible interpretation of that phrase) about whether the person liked you or not. I would often do that strange thing that if I was talking to a group of people, most of whom seemed engaged, but one person was not giving me the feedback I expected (or craved?) I would home in on that one person and start ramping up the puppy dog to get the response I wanted. This, of course, would have disastrous effects. Not only would I have the exact opposite effect on this one person, I would lose the rest of the group as well! Anyway, why am I going on about this now? Well I still, to this day, mess these things up (I am only human). I have recently been reconnecting on LinkedIn with some old (in some cases very old) contacts. And with one contact, in hindsight, I realised I went all “puppy dog”. I did all the right stuff (I think), but I was way too enthusiastic in my replies. So if that person is reading this, this is a public apology for getting a bit carried away (it would be funny, wouldn’t it, if the person I thought I had been a bit overly enthusiastic with thinks it was fine and someone else thinks I am talking about them?!). The picture is of my dog when she was a puppy. 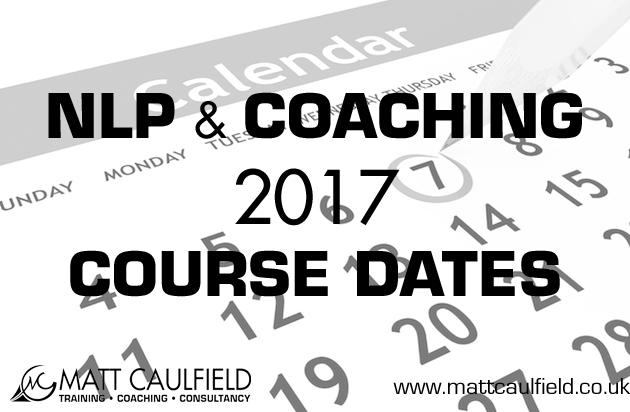 Below are my currently planned NLP and Coaching training course dates for spring 2017. Autumn courses will be added later in the year. For details and to book, please click here. Become a master of change and influence. Book on both the Practitioner and Master Practitioner course at the same time and save £1000. This is my most popular package. 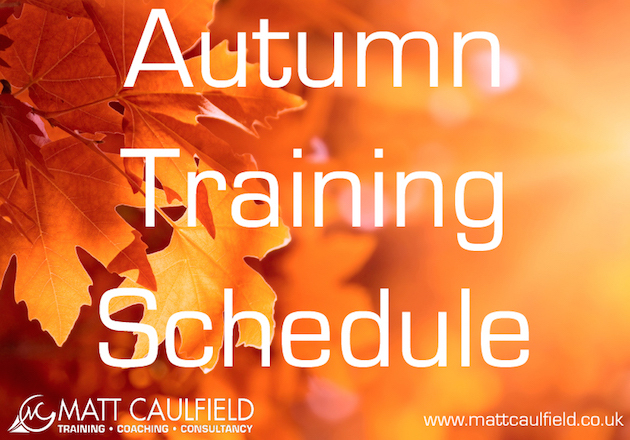 Learn two of the most powerful tools for change today – NLP and Coaching, and save £200. If you have any questions or would like assistance with booking, please contact me here. I know for some people they are still in the middle of the summer holidays and don’t want to think about the autumn. If that is you I apologies, but September, and the beginning of my autumn training schedule is fast approaching. There is still limited places available on all courses, but they are filling up fast. If you would like to secure your place, all I need is a 10% deposit at the time of booking. You can then choose to pay in full or in instalments (6 or 12 months depending on the course or package). The full details of all courses can be found here. Do you want to learn Coaching or master it? This package is the same as about but also includes the NLP Master Practitioner course. You save £1350. This course is the same as above but includes the all new Business Master Practitioner of NLP course (coming in spring 2015). Save £1350. Do you want to review, revise or improve your NLP skills? Want to benefit from NLP without wanting to be qualified in it? Or want to train in NLP and can’t or don’t want to attend a training course. I offer one to one sessions to help you achieve your goals. For a no cost 20 minute consultation to see what approach would be best for you please get in touch. For any more information, to book on any of these courses, or to discuss a one to one session, please do get in touch by contacting me here. This may be a strange way to begin a blog article about how NLP can help improve your sporting performance, but I used to hate sport. My family aren’t huge sport fans so I didn’t really grow up watching any, and I was gangly and uncoordinated as a child and teenager, so was rubbish at playing sports myself. Add to that, most of the people I knew at school, who were good at or interested in sport, were your typical “jock” types who would bully and pick on me for being rubbish. It is no wonder that I quickly developed a very powerful limiting belief that sport was rubbish and for dullards. This limiting belief lasted until my early 20’s when I discovered NLP. I became fascinated with what makes one person exceptional and another mediocre, what makes someone who can act at the peak of their ability most of the time and someone who can’t. I quickly discovered that nowhere is this more powerful and important than in sports. I started working with friends and friends of friends to help them improve their sporting performance, whether that be golf, long jump, cycling, football or martial arts. Although psychological tools have been used in sports performance for decades, sport psychology has exploded in recent years with everyone suddenly realising the importance of your mental ability in your sporting performance. At the highest level of sport, it is rarely physical ability that decides who will win, it is who wins the mind game. NLP may have begun in the early 70’s by studying therapists, but very quickly its methodology was applied to a broad number of fields from business, to eduction, to even the military! NLP can help you overcome the self doubt, nervousness, anxiety and lapses of concentration that keep you from performing at your best. It can help you accelerate your learning ability to master skills quickly and easily and allow you to act at the peak of your potential when it really counts. When translated to real-life scenarios, research shows that many of the same benefits exist for imagined or physical actions. By just mentally practising a skill you achieve similar levels of accuracy as those who physically do it. Many people I have spoken to have said they have tried visualisation and found that it did nothing. The problem with using the word “visualisation” to describe this process is that it forgets the other four senses. So people just focus on getting the picture in their mind right and don’t pay attention to anything else. Take some time to really imagine carrying out a specific element of your chosen sport (kicking a penalty, starting the sprint, etc), really take the time to SEE what you see, HEAR what you hear and FEEL what you feel. If it helps, at this stage, take up the posture, don’t actually physically mimic the process but getting into the starting posture can help. You will probably notice the muscles you use for this technique subtly tensing. As you do it, intensify the process, make the pictures bigger and brighter, the sounds louder and the feelings more intense. NLP originally began by “modelling” the behaviours of excellent therapists, to find the “difference that made the difference”. We can use this same method to understand what makes top sports people stand out and learn how to do it ourselves. Think of a sports person you admire for a particular technique. Imagine them doing it, perfectly. If you can, watch them do it over an over again until you have a really good visual image of all the details. Now close your eyes and, in your minds eye, see them in front of you doing this technique, run it through in as much detail as you can, slow it down, pause it at important points and really pick up ALL the detail. Then, when you are ready, step into them and BECOME them. Take up the exact posture that they have, notice every little detail, think how they think and mime the technique as they do it. Continue to to do this until you are doing it exactly the same way as they do. Do you find your skills are top notch in practice, but when it really counts you choke? In a related idea, Timothy Gallwey, the Godfather of modern coaching, lays out in in his seminal work ‘The Inner Game of Tennis’ his idea of “Self 1” and “Self 2”. “Self 1” is the ego-mind or “teller”, while “Self 2” is the body. “Self 1” instructs, “Self 2” acts. When we perform at our best, we are Unconscious Competent, we don’t have to think about what we are doing. We don’t need or use “Self 1”. However, when we find ourselves in an important situation (the penalty kick, the serve at match point, the winning putt), we feel we need to really concentrate, we really need to think about it. But that means “Self” 1 tries to tell “Self 2” how to do something the latter already knows how to do. We become consciously competent, we become LESS COMPETENT! The key here is to distract what Timothy Galway called Self 1 (your conscious competent self) to allow Self 2 (your unconscious competent self) to do what it already knows what to do really well. The best sports people don’t choke, as they trust Self 2 enough to not let Self 1 get in the way. Self 1 tends to manifest itself in “self talk”, we start running a commentary in our heads of what we should be doing. Although this can be useful in some context (“commentary driving” is a well known advanced driving technique), it isn’t in this situation, so we need to do something to shut down that self talk. To do this, you simply need to say something nonsensical instead (in the same way that mantras are used in meditation to quieten the mind). ‘Flow’ (as all the cool kids call it nowadays. I remember when it used to be called “The Zone”! ), is defined by Mihaly Csikszentmihalyi as “…the holistic experience that people feel when they act with total involvement.” It is that mental state you go into when you are performing (and helps you be at your best). You feel like you are just a passenger (in a good way) in the situation. The difference between the winner and loser in a sport is dependant on who can enter a ‘flow’ state at the RIGHT time. Your brain is highly efficient, it looks for the simplest way of understanding or do things. One of the ways it does this is to bundle experiences together. If two things occur at the same time, it tends to treat them as related. Say you are in a particular mental state (happy, sad, anxious, excited, etc) at the same time as some form of discrete sensory stimulus takes place (a certain sound, smell, etc), our brains will treat them as related. This means we can “capture” a state by intentionally carrying out a sensory based action (a gesture, posture, phrase for example) whilst in that mental state. So, the next time you find yourself in a ‘Flow’ state, consciously take the time to carry out a specific action, for example, squeeze your finger and thumb together, pump your fist, etc., in order to relate this action with the wanted state. Then next time you need to enter a Flow state you just need to repeat this gesture. We have all had bad days, when everything seems to go wrong. No matter what we do. What tends to happen is we dwell on everything that went wrong and get hung up on all the errors we made, but sometimes those terrible performances can be some of the best learning experiences. With NLP we can discover what the difference was when you were having the worst performance of your life and when you were unbeatable. This knowledge will allow you to play at the peak of your ability when it really matters. NLP can be described as the study of the “difference that makes the difference”. You need to compare that terrible experience with your best. Your skills don’t suddenly evaporate overnight, the difference is what you were thinking and feeling at that time. When Anthony Robbins worked with Andre Agassi, he got Andre to give him two tapes – one of the best tennis match he ever played and one of the worst. He then watched them both with Andre and asked him specific questions about what the difference was – what he was feeling and thinking in each match. Have a go yourself with an experience where you felt you did not do your best and find the differences. NLP allows you to break down, in a very easy step by step way, the mental and physical aspects of your skills. It can help you recognise the elements that are missing, what you need to do more of and what you need to change, to rapidly improve your skill level. Once you can map out the sensory steps of the skill or technique you can use that to inform and improve your own performance or teach that skill to someone else. Ask yourself how you know what you are doing is working. What is the test you are using to let you know that you are doing it right. Once you have effectively defined your “test” you can see what resources your need to succeed. To learn more about how NLP can help you break through your limitations and be at the peak of you ability please see my “Sports Applications of NLP” workshop, or contact me to discuss one to one or in house coaching and training. 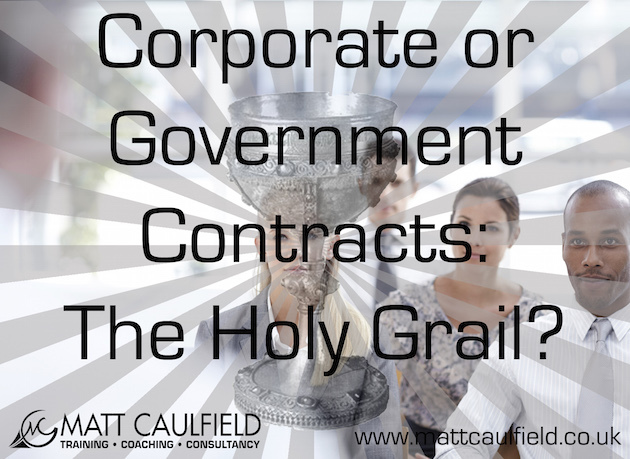 Corporate or Government Contracts: The Holy Grail? Yesterday I posted a link to an article in the Independent about how Capita have been accused of allegedly abusing it’s position as training provider for central government. 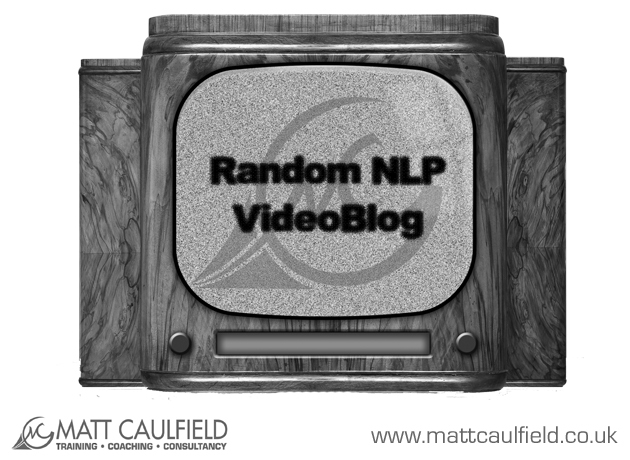 That, along with the publication of my latest NLP Demystified series “Your Professional NLP Practice Demystified” got me thinking about that supposed holy grail of any trainer or coach – the contract with a corporation or government institution. One of the most common questions I get from people who want to set up as NLP trainers and coaches is what I think of corporate and government contracts, if they really are the holy grail people think and, if so, how to get them. So here is my take. Firstly, you have to think whether you actually want one! There may be a belief that a big corporate or government gig is the holy grail, the cash cow, that will make you rich and successful, but sadly it isn’t true (as we will see). (Note: I have used the word “company” to denote both a corporate or government contract for brevity and ease of reading). If you contract with work for reasonably large company, you will be expected to abide by their terms and their their contract. You may want to charge £35 an hour travel, stay in 5 star hotels and be paid upfront, but if their terms are 90 days and only pay 43p a mile and £50 overnight expenses, thats what you have to accept. There may be additional clauses in the contract too, so you will have to pay very careful attention, like who owns the rights to the course or coaching package you deliver, anti-competition clauses (not being allowed to work for anyone they deem as the competition) and all sorts. You have to be really on the ball and sometimes even employ a lawyer to go through it all (which eats into profit). Day rates used to be high (most trainers I knew were on £1000+ a day, most coaches £150+ an hour) and there used to be a lot more work to go around, but that has all changed. Yes, there are some trainer and coaches who can still charge that (me included), but that is because they have a reputation, references and a track record. If you are just starting out you won’t get anywhere near that, unless you are very lucky or have the right contacts (it really is all about the contacts, see below). Supply has increased significantly, demand has fallen and the process has become much more complicated and time consuming with more third parties, paperwork and processes (tendering and such) to go through to get the gig. Unless you have a strong reputation you will earn about £200-£500 a day for coaching or training, which may sound a lot, but you won’t be working every day (on some occasions you may be lucky to get a day a month). I have known a number of trainers who have gone bust because they put all their eggs in one basket and taken work on from just one company. All of a sudden that company has not renewed that contract and they have been without an income and scrabbling round trying to find work. Most of the BIG contracts (the ones that pay well) are almost full time jobs (see below) and you will take up all your time, meaning you are running the risk of not diversifying your income. Other trainers I know have worked through agencies (see below) and all of sudden the agency has cut their day rate or work has dried up, again meaning they struggle to make a living. What is much more important than chasing that big cash cow contract which will give you a perceived sense of security (but not real security), is to build multiple streams of smaller incomes so you are not overly reliant on just the one. Almost a Full Time Job? If you are contracted to just one company as an external coach or trainer, you are essentially working for them without all the benefits of actually being employed! No sick pay, no holiday pay, no redundancy. Still with me? Still want to go for corporate or government contracts? Lets have a chat about how you actually get them. It used to be about supply and demand. A company wanted a coach or trainer and would look for one. They would contact a few, have a chat, get a quote and then decide which one they preferred, it was all very straightforward. If you had a good reputation and were easy to find and put yourself out there a bit, you would tend to get approached fairly frequently (that was how I got all my in-house contracts back in 2007!) There were agencies and tendering back then too, but because NLP and coaching was less known, the scope for that was very limited. Nowadays a large proportion of in-house work is through agencies or a tendering process. I used to have a rule of thumb that if someone wanted me to tender for some work, I would refuse to do it on principle. I was (and still am) very skeptical of most tendering processes. It was once summed up to me by a procurement manager that I knew as “ Cost first, quality second”, so they would often employ substandard and or inappropriate trainers or coaches as they were the cheapest and then get terrible feedback from the delegates! This is still the case, if not worse! More and more companies are asking for you tender for work. Tendering used to be reserved for very large contracts but the threshold has been lowered by many companies meaning almost all training and coaching programmes have to go through this process now. This, to be honest, is a nightmare for individual freelance coaches and trainers. Tendering in itself is a very specific skill set, and is time consuming and costly processes (incidentally, in some cases, you used to actually be able to charge to submit a tender. You can’t any more). Add to that the fact that trying find a tender is a nightmare! Most tenders are listed on specific websites that charge you a (not inconsiderable) fee to join and be alerted of any tender you may be interested in. So, you have to find the websites where the appropriate tenders are listed, join, pay the fee, search for any tender you may want to go for, complete bid and then hope that you get awarded the contract. It is a long, drawn out process that most trainers and coaches are ill-equipped and ill-prepared to do. The way companies such as Capita tend to work, is they are experts at the tendering process and at building contacts. What they are not experts at is delivering the training or coaching package. For that they will have a network of third party trainers and coaches that they will draw on to deliver the packages they have successful bid for. Sometimes they will already have people on their books that can do it, other times they will need to find someone (it is not uncommon in my experience for such companies to bid for work they cannot yet deliver and then, if they win the contract, scrabble around trying to find someone to do the work). Which means they may contact you out of blue (as I have been on several occasions) when they have won a contract and don’t have anyone to deliver it, but more often than not they will have a banks of trainers and coaches to draw upon. 1) Most agencies specialise in a particular business sector – legal, finance, etc – and not in the training or coaching packages. Which means you will need to sign up to a number of them to get a broad range of work (this also reduces the risk of putting all your eggs in one basket – see above). 2) Your training fee will be a lot less (in my experience up to 50% less) than if you work directly with a company. You will earn around £300 when first starting out. 3) Some pay expenses, some don’t, so make sure you clarify that before accepting work a long way away. 4) Don’t think you can use them to get an initial contact and then re-negotiate directly with the company once you have built a relationship. Many of these agencies have an anti-competition clauses meaning you cannot work with any company directly that they have an relationship with. If you are happy to accept the lower day rate and more restrictions (not always in exchange for more regular work) this may be perfect for you, especially if you are not comfortable with selling yourself or lack the contacts. I know of trainers and coaches who work almost exclusively through agencies as they feel more comfortable with that than touting themselves out and they are very happy. I must make it clear that I am not against these sort of agencies, I am signed up to a few myself. But what I do have an issue with is a number of agencies that have cropped up who have taken advantage of the fact that more companies are tendering for work and most individual coaches and trainers lack the knowledge to be able to bid. Many of these are too small for the larger agencies to bother with. So what they do is get the tender then offer the work out to anyone they can find, for a meagre sum and pocket the lions share themselves. This bluntly is a scam. I have been approached by a number of such companies who offer a laughably low day rate. Sadly they, more often than not, find someone desperate enough to accept the work. It is a real shame. Please be very careful when working with agencies and make sure you only accept work or approach ones with a track record, references and good reputation. My recent experience in trying to make direct contact with anything more than an SME, is that you will hit a wall of bureaucracy, requiring a tendering process, or they will be outsourcing their training to the one of the agencies. Of course, even with all these additional barriers to entry it is still possible to get “straight in”, this is most commonly for shorter training or coaching programmes though (where a tendering process is just not cost effective). You may be contacted because they have heard of you and your reputation, or you have been either mentioned or specifically referred by someone (this is how I still get around 75% of my in-house work nowadays). Or you could focus purely on SME’s, they tend to have a more straightforward process for in-house training (but a smaller budgets). This is why having contacts is so important (see “Your Professional NLP Practice Demystified”), if you don’t have any relevant contacts yet, you need think of ways you can run in the same circles as your prospective clients. Business clubs, events and networking organisation are good things to consider. Join professional organisations and go along to their workshops, seminars and event. Offer to do talks to organisations. Remember, if you are going to these to avoid the direct sell, it is about building contacts (it is also a long game, you may not see any fruits from your labour for some time, but I have had people contact me years after). LinkedIn is also a great place to build contacts, but that really is a topic for another post! This may, in places, sound a bit of a cynical post. That is probably because I really wanted to highlight the pitfalls that most people don’t know of. The world of in-house training has changed a lot since the “credit crunch”. No doubt some of these changes will be permanent and some only temporary until things settle down (it is hard to believe it has been 7 years and things are still in a bit of flux). I am certainly noticing that direct contact from companies as increased in the last few months, mainly for sending employees on my open training courses (where the agency or tendering model aren’t appropriate). You hopefully now have some more knowledge and choices about what you can do to get company contracts and are more aware of how it works. https://mattcaulfield.co.uk/wp-content/uploads/2018/07/Enfold-Header-logo.png 0 0 Matt Caulfield https://mattcaulfield.co.uk/wp-content/uploads/2018/07/Enfold-Header-logo.png Matt Caulfield2015-02-12 17:03:052015-02-12 17:03:05Corporate or Government Contracts: The Holy Grail? 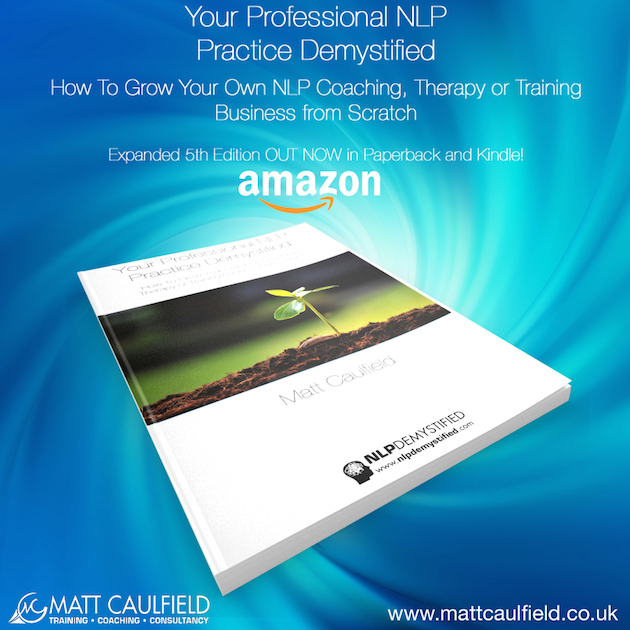 The latest book in the NLP Demystified series is out now – It is in fact a (long overdue) updated version of my best selling guide that has been around in various guises since 2008. I have hacked the marketing section out and started again. In fact, there is LESS in there now than there was. Gone is the part about Search Engine Optimisation, Pay Per Click and getting to the top of search engines. Gone is the section on building a mailing list, gone is the section about Social Media, gone is the section on press releases and giving talks. Gone are the ‘Four Keys’. Why? Well, for a start it was horribly out of date, and secondly (and most importantly) it was too generic and the strategies I was offering simply did not scale. It did work when I wrote it, but now, because everyone is doing it, and the supply of coaches, NLPers, and so on has massively increased it is extremely hard, if not impossible to be heard over everyone else shouting. So you have to do something else. And, I appreciate that (hopefully!) there will be a number of people reading this book and implementing the strategies in here. It felt impressive to have lots of pages packed with information and I cringed as I deleted page after page of the work I had carefully crafted. But that went against my philosophy of demystification and simplification. I need to give you something that is scalable, that you and others can do and you all get successful. So I have given you a new strategy, a simple strategy, one that can get you from zero to clients very quickly and easily (and cheaply) indeed. How to decide on your niche, trading name and promotional material. A crash course in marketing essentials. The very first strategy you need to do to get clients. How to get clients even if you know nothing about marketing or HATE the idea of selling yourself. How build a professional looking website at no (or very low) cost. The essential set up required to make your business a success. A simple, but complete business plan. Essential questions you need to answer before you even think of starting out. The common mistakes to avoid! An Excel financial plan spreadsheet pre-filled with all the formulas so you can get your figures straight. A workbook of all the exercise in this book for your to print out and work through. A pdf of the marketing and business structure flow chart. Market research and customer questionnaires. I will even throw in a pdf version of the 4th edition of this book, so you can see what I have cut out! As usual I am offering PDF review copies for anyone who wants to write a review on Amazon, their blog, website or facebook page, please get in touch and I will email you a copy (again, this isn’t a “free” copy of the book! But a copy sent in exchange for a review!). I would also appreciate it if you notice any glaring mistakes or errors – the book has been thoroughly proofread by me and a third party, but mistakes can sneak through – please let me know so I can rectify them asap!